Why should Congress and President Donald Trump pursue tax reform this year? Well, the reasons are many, but let's focus on three main arguments. First, the United States hasn't seen annual economic growth of 3 percent or higher since 2005. Over the past decade or so, Congress has passed several laws that have negatively impacted the economy. These include income tax increases, capital gains and dividend tax increases, ObamaCare tax increases, Dodd-Frank, and much, much more. Another factor hurting the economy is the alarming growth regulatory state, which cost the economy nearly $1.9 trillion in 2015. Second, the costs of complying with the tax code are ridiculous. In 2016, according to the Tax Foundation, Americans spent 8.9 billion hours complying with the 70,000-page tax code. Compliance cost the economy $409 billion, which is more than the gross domestic product (GDP) of the state of Maryland. Finally, Americans are in need of a pay raise, and tax reform is a way to boost economic activity and wages. If Congress passes a pro-growth tax reform plan, consumers would have more money to save and/or spend, boosting demand for goods and services, allowing businesses to boost wages and hire more employees. Speaker Ryan and House Ways and Means Committee Chairman Kevin Brady (R-Texas) have made it clear that they want to pursue fundamental, pro-growth tax reform in 2017. In June 2016, Speaker Ryan rolled out his “A Better Way” policy agenda for the House Republican Conference. Included in the agenda is an ambitious tax reform blueprint that represents a significant departure from the current tax structure. The House Republican blueprint would consolidate the current tax rates into a three-rate structure: 12 percent, 25 percent, and 33 percent. It would increase the standard deduction to $12,000 for individuals, $24,000 for married couples filing jointly, and $18,000 for heads of household. It would also reduce the top corporate income tax rate from 35 percent to 20 percent, reduce the top capital gains tax rate from 20 percent to 16.5 percent, and eliminate the estate, gift, and alternative minimum taxes. To broaden the tax base, the House Republican proposal eliminates virtually all tax deductions and credits, although the charitable tax deduction survives. The mortgage interest deduction is still available. Those with existing or new loans can still receive the mortgage interest deduction if they wish to itemize but would have to choose between the deduction and the standard deduction, which may actually be greater. Some tax credits, including the earned income tax credit (EITC), would also continue. There are plenty of other details, such as a move to a territorial tax system, full expensing, the border adjustment tax, and more. For purposes of this post, though, we'll stick to the basics. (We'll have more about the border adjustment tax very soon.) 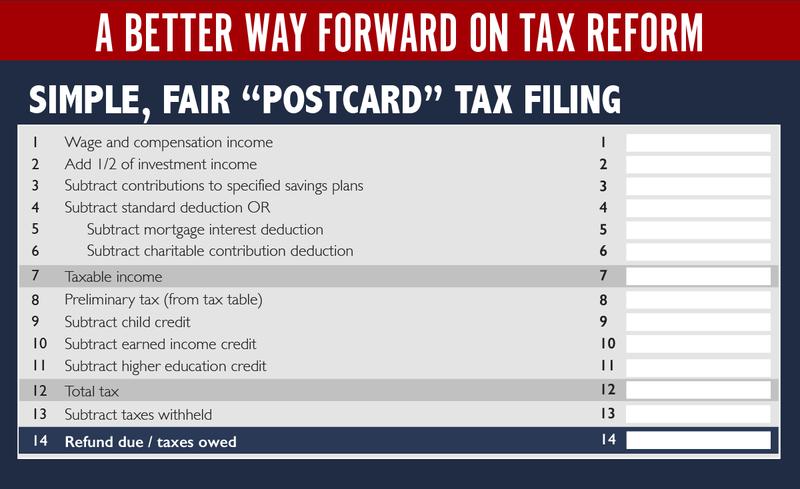 In addition to lowering rates to produce economic growth, a goal of the blueprint is a tax return so easy that you can fill it out on the back of a postcard. In July 2016, the Tax Foundation estimated that the Republican proposal would increase GDP by more than 9 percent, capital investment by 28.3 percent, and the wage rate by 7.7 percent. Taking macroeconomic effects into account, or dynamic scoring, the proposal would reduce revenue by $191 billion. Separately, the White House has released its own tax reform plan. Although it's light on specifics, President Trump's plan would, like the House Republican blueprint, would consolidate the current tax rates into a three-rate structure: 10 percent, 25 percent, and 35 percent. Unfortunately, the income thresholds aren't specified, but they are similar to the rates under the plan introduced by then-House Ways and Means Committee Chairman Dave Camp (R-Mich.) in 2014. The White House's plan would broaden the tax base, although there are no real details on how it would accomplish this. It would increase the standard deduction to $12,700 for individuals and $25,400 for married couples filing jointly. It would also reduce the top corporate income tax rate from 35 percent to 15 percent and eliminate the estate and alternative minimum taxes. It also calls for a territorial tax system. 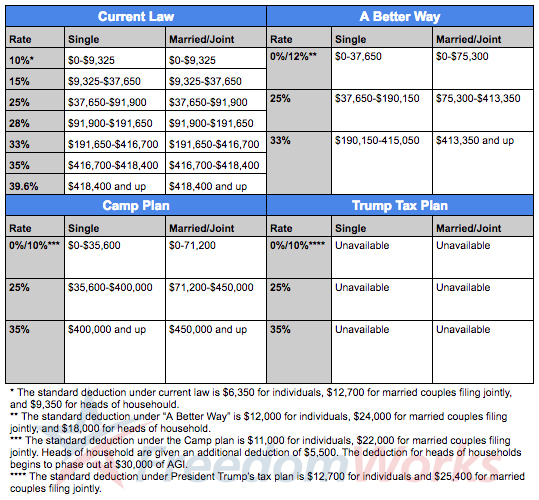 Like the House Republican blueprint, tax simplification is a goal of the White House's plan. Tax reform isn't going to be easy. Journalists Alan Murray and Jeffrey Birnbaum documented the 1986 tax reform effort in their book, Showdown at Gucci Gulch: Lawmakers, Lobbyists, and the Unlikely Triumph of Tax Reform. It was an unlikely atmosphere, as lobbyists sought to protect their carve-outs. But Congress got it done. Good tax policy means having a broad base and low rates. Unfortunately, there is a litany of tax credits and deductions in the federal tax code that feed special interests. There will be internal and external challenges that could pose significant problems for tax reform, much like those behind the 1986 tax reform overhaul saw. Among these challenges are Democrats, realtors, home builders, retailers, and states with an individual income tax. But if we conservatives fail to get fundamental tax reform done this year, Americans will suffer the consequences, as prosperity and opportunity will continue to be harder to come by.